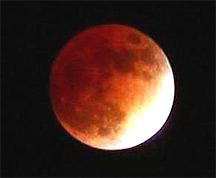 The lunar eclipse of November 8, 2003. The history of eclipses provides many excellent examples of human patterns of interpretation of events. Because we now know how eclipses occur, it's easier for us to objectively evaluate interpretations made by those who lived in times before we acquired our modern understanding. One illustration comes to us from Thucydides, in The Peloponnesian War . He writes that in the nineteenth year of the war, the Athenians, who had laid siege to Syracuse for two years, determined to break off the siege, which had been at best a mixed success. But on the evening before their planned departure, a total lunar eclipse occurred. One of the commanders, Nicias, after consulting seers, determined to stay for another 27 days, and during that time, the Syracusans attacked and defeated the Athenians. Possibly Nicias had been motivated solely by religious faith, but in the debates that occurred among the Athenians during the weeks prior to the eclipse, Nicias had been a staunch holdout for maintaining the siege. It's likely that his interpretation of the lunar eclipse was driven more by his preferences, preconceptions and agendas, than by religious faith. This premise is easier for us to accept, now that we understand eclipses, than it would have been for Nicias' contemporaries. Photo by Nicolas M. Short, courtesy National Aeronautics and Space Administration. Some time ago, a client — let's call him Bert — reported that his boss disliked him. "Oh," I said, "how come?" It turned out that most of Bert's evidence was based on his boss's silence when Bert did good work. If there were difficulties, his boss did intervene, but otherwise he said little. Bert said, "I hear from him only when I'm in trouble. He hates me." Bert could have been right, but there were other possibilities. With a little difficulty, and some encouragement, Bert accumulated half a dozen alternative explanations, some quite flattering of Bert. That led us to explore how we interpret events. We see things. We hear things. We interpret them, sometimes nearly instantaneously. And when we do, we tend to overlook other interpretations consistent with our observations. Here are some patterns that lead us to overlook possible interpretations. At times we assume that when people behave the way we sometimes do, they have the same reasons we do. That is, if I become withdrawn when angry, I assume that when people seem withdrawn, they're angry, too. Remember that my reasons for what I do might not be your reasons for doing that very same thing. Omniscience is beyond anyone's reach, but we often assume that we fully understand others' circumstances. We then use that mistaken understanding to explain their behavior. Seeing things as others see them is difficult even when they tell us what they see — and usually, we just guess. Asking is better. See "The Mind Reading Trap," Point Lookout for October 10, 2001, for more. There are some explanations that we wish were untrue. There are others that remind us of repulsive things, or things we fear. If our revulsion is strong enough, we can trick ourselves into ignoring these possibilities. Interpretations are more likely to be correct if you've included for consideration any factors that repel you, scare you, or would make life really difficult. Avoidance's companion is Preference. Sometimes we confuse truth with what we want to be true. Too often, we accept without question that which confirms our beliefs, provides us with excuses, or absolves us of responsibility. Take time to review how you know what you know. Is it really so? Test it. When events remind us of past experiences, we sometimes return involuntarily. We repeat the past, or live it the way we wish we had, instead of making choices that fit the here and now. Staying present can be most difficult. Take extra care when you notice similarities between the now and the then. For more on the involuntary identification of the there-and-then with the here-and-now, see "You Remind Me of Helen Hunt," Point Lookout for June 6, 2001. Would you like to see your comments posted here? rbrenEGBctiDCrcdxLEqBner@ChacYTxTTFVtmAyOIdtmoCanyon.comSend me your comments by email, or by Web form. I offer email and telephone coaching at both corporate and individual rates. Contact Rick for details at rbrenmEiPIHXiXNGfwUEJner@ChacECkOxfbxhplENRbAoCanyon.com or (650) 787-6475, or toll-free in the continental US at (866) 378-5470.